Washington C.H. City Manager Joseph Denen read a proclamation asking the community to accept and support those with autism. On Wednesday, a photo was taken on the Fayette County Courthouse steps in support of Autism Awareness Month. Several groups were represented in the picture including: Washington Police Department, Fayette County Sheriff’s Office, Fayette County EMS, Washington Fire Department, Fayette County Board of Developmental Disabilities, Frontier Community Services, Fayette County Memorial Hospital, local health providers, local educators including Miami Trace Local Schools and Washington Court House City Schools, local attorneys and judges, local court employees, city and county officials, local businesses, Carnegie Public Library, Fayette County Public Health, the Fayette County Post Office, The Record-Herald, members of the autism community, local nonprofits and religious affiliations. 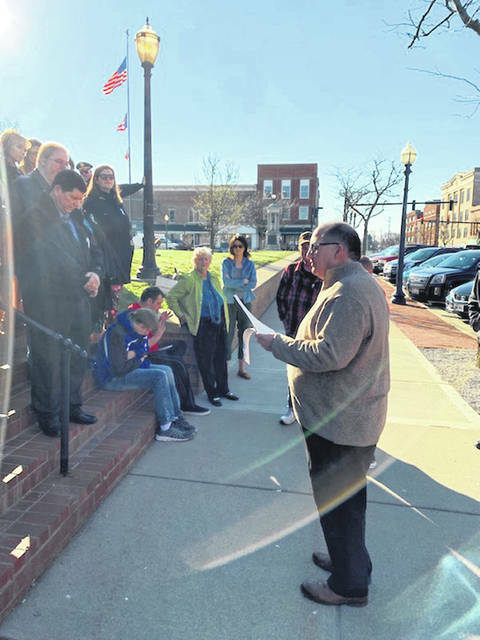 Many officials, leaders and citizens representing government, organizations and businesses gathered Wednesday morning at the Fayette County Courthouse to show their support for Autism Awareness Month. 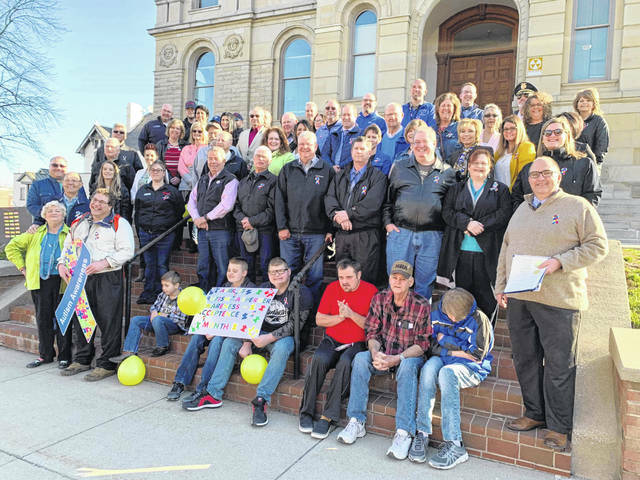 A photo, organized by Rose Hazelbaker, was taken on the courthouse steps. Hazelbaker is a Washington Court House resident who expresses much passion in sharing information and finding resources for and regarding autism. She, herself, has a child with autism who has provided her with many experiences. In the past, autism was not known. Children were misdiagnosed and those with autism were placed outside of society in institutions. It was a common view that the cause was how the children were raised. Since parents were often blamed for the disorder, shame was a common feeling associated with autism. More information on the history can be found at www.nationalautismcenter.org. Now it is known that autism is a neurological disorder and is most likely caused by a combination of factors in both genetics and the environment. Parents are not where the blame belongs, but it is believed that many people in society do not truly understand this. Autism Spectrum Disorder (ASD) “is a complex developmental disability” that acts as an umbrella term, according to www.autism-society.org. It is considered a developmental disability as signs tend to first appear during the first two years of life, however autism can be diagnosed at any age. The disorder affects the ability to communicate and interact with others. The disorder, as Hazelbaker wanted to point out, does not take away emotions or intelligence. Those with the disorder can still understand what is happening around them and will still have emotions even if they are unable to communicate those feelings or thoughts. Autism is a unique disorder that can be a little different in every individual. Some are able to function within society, which is unofficially called high-functioning autism and used to be diagnosed as Asperger’s Syndrome (AS). Essentially, these are individuals who are able to communicate more effectively and are most likely able to read, write, speak and handle basic life skills. They may even be capable of living independently of caregivers. AS, often called Asperger’s, was a previously used diagnosis separate from autism. Although people will still identify themselves under this diagnosis, it is no longer officially utilized. In 2013, it became part of the umbrella term: autism spectrum disorder. According to the Autism Society, “What distinguishes Asperger’s Disorder from classic autism are its less severe symptoms and the absence of language delays.” Hazelbaker pointed out that those with AS are often mistaken as being difficult: stubborn, selfish or defiant. The earlier autism is diagnosed, the earlier treatment can begin. People do not outgrow autism, but they are able to be trained and taught various life skills to assist them to better communicate and live independently. Early signs of autism, which can be found on the Autism Society website, include: lack or a delay of spoken language, little or no eye contact, lack of interest in relationships with peers, lack of make-believe play, a persistent fixation on parts of objects and repetitive language or motor mannerism use (like hand-flapping or twirling objects). Other symptoms, according to information Hazelbaker put together, includes: unusual body language, unusual gestures, unusual facial expressions, seizures, avoiding eye contact, lack of interest in others, lack of interest in sharing interests and achievements, unlikely to approach others or pursue social interaction, prefers to be alone, comes across as aloof or detached, difficulty understanding people’s feelings or actions, difficulty understanding others nonverbal cues, resistance to being touched and difficulty or failure to make friends with children their age. Those with autism are typically sensitive to stimuli. Loud sounds, bright colors or being touched can easily cause too much stimulation for them to handle. There are ways to better work with and communicate with people who are diagnosed in the autism spectrum. Several resources exist online. The proclamation was signed on April 3 by Denen, Washington C.H. City Council Chairperson Jim Chrisman, and the Fayette County Commissioners: Tony Anderson, Daniel Dean and James Garland. Hazelbaker recalled a time when her son was 6-years old and when asked by his teacher to draw a park, he drew an intricate picture of a sewer system. When the teacher asked about the drawing, the child explained he wouldn’t want to go to a park without a bathroom. Hazelbaker is having a coloring competition for kids ages 5-10. When families eat at Frisch’s Big Boy, kids can color four pieces of a puzzle the colors of red, blue, yellow and green. The competition ends Sunday and there will be three winners chosen for a gift certificate. Chris Bashaw will be the judge of the competition as Hazelbaker said, “Chris loves art; he is so good at art.” The colors and puzzle signify the uniqueness of those who fit into the autism spectrum. Follow the Record-Herald for information on more Autism Awareness Month community events happening in Fayette County. Those planning events can contact Jennifer Woods with information.